A few months ago, I read and reviewed Mary Gentle’s 1983 novel Golden Witchbreed and reviewed it here. This week seemed like a good time to get around to reading the sequel, in which Earth representative Lynne de Lisle Christie returns to the world of Orthe after eight years, as part of a delegation intending to negotiate access to the ancient technology that litters the world. I knew, going in, that it was a book that divided opinions; I didn’t know much else. I discussed the book — up to and including the ending — with Duncan Lawie by email in November and December. NH: We can take it in turns with the questions, but I’ll put you on the spot first with something nice and general: how would you characterise the relationship between Golden Witchbreed and Ancient Light? DL: It’s rather a cliché, but to my eye the pair are a diptych of innocence and experience, youth and age, certainty and doubt. Golden Witchbreed is a First Contact book, with Lynne de Lisle Christie enthusiastically engaging with the world around her, taking chances, trusting fate, rushing in. The people of Orthe and the world they live in are there to be investigated and understood, even as they try to kill her or discredit and reject Earth’s influence altogether. As a reader, it was a chance to learn a world as Christie travels low tech through a full flow of seasons. In Ancient Light, Christie returns, ten years older and every simple truth she thought she knew seems to be just one horn of a dilemma. She doubts her own mind, her motivation for being there. She spends much of the book caught between bad choices, accepting she can’t fight PanOceania, for whom she now works, and attempting to mitigate the disaster for Orthe of being controlled by a Company. She stands weary (at the age of 38!) before the vim and vigour of the youthful Company Representative, then uses her decade’s advantage to stare down this younger commander. With the resources of the PanOceania, the characters flit about the planet’s surface, never connecting, always controlling. The hard won knowledge from the first book is background knowledge, the people natives to be exploited or protected. There seemed to be a lot more message in the second book, more science fiction, while the first was more of a planetary romance. But it’s a long time since I read Golden Witchbreed. Maybe they look more of a piece read closer together? NH: I think they do. I’m not sure whether this is a function of the fact that I read them close together, or of the fact that I read Golden Witchbreed knowing there was a sequel (and a contentious sequel, at that) lurking in the background — but either way, I was aware of unanswered questions in Golden Witchbreed, issues to do with further contact deferred and not resolved. And so Ancient Light felt to me very much a natural extension of the first book, as the various tensions that the existence and nature of Orthe creates for humanity start to work themselves out. I also felt the sense of Christie being more detached than in the first book, but I hadn’t made the literal connection that she spends the novel flying back and forth, rather than walking across the world; that’s a useful observation. It accentuates her increasingly fraught attempts to prevent the situation on Orthe degenerating into chaos. But I think you’re right to suggest that the humans move to the foreground — it’s perhaps something that starts to date the novel (I didn’t think Golden Witchbreed felt very dated at all), in that I doubt you’d get an sf novel so explicitly about colonialism nowadays without some attempt to represent the perspective of the colonised. I suppose Ancient Light offers that to an extent, through the memories of past Orthean lives that Christie has inherited, but they seem so exceptional that I don’t think they fill that role very well; of course in other ways it seems to me a very sophisticated take on colonialism. I think the first aspect of the novel I want to delve into, though, is its structure and shape. 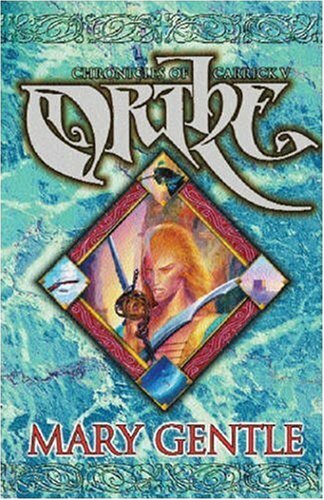 In the 1987 year-in-review piece reprinted in Look at the Evidence, Clute offers a brief assessment: “Mary Gentle’s Ancient Light (Gollancz), which is a sequel to Golden Witchbreed (1983), and which is designed to terminate the series, dots every i for innumerable pages, finally to come somewhat phosphorescently to life in its final hundreds, when the author gets properly aroused by her task of demolition, about which she is very thorough.” Leaving aside the matter of the ending for now, two reviews in Vector 142 make a similar point about pacing: Barbara Davies writing “Although broken down into seven parts, 40 chapters seemed rather too many. The plot would have gripped better if it had been shorter”, and Maureen Kincaid Speller (Maureen Porter, then) commenting that “Lynne’s internal monologues and her long, visionary experiences tend to slow down the action too much and give a rather leaden effect”. Both conclude that it’s a worthwhile book, but — did you find it a slog? I didn’t; what I found it was inexorable, that it had an absolute inescapable momentum. Several times, it’s suggested that what is playing out is inevitable. Is that how it felt to you, and if so, what conclusions do you draw from that? DL: In rereading, knowing the ending – also holding off from talking about the ending – the book was absolutely inexorable. I’m sure that wasn’t the case the first time around. Instead I recall enjoying the expansion of the world from spending time in the desert societies, I loved the chance to revisit places already known, picking up stories and characters from the first book. Indeed, Paul J. McAuley in Interzone (#23, Spring 1988) said “the easiest way to follow it [Golden Witchbreed] (and considering its success, the safest way too) would have been to check off all the places missed the first time around”. And the book does give that impression to begin with, aided by wrapping it in maps and appendices and following the first book’s style of many parts. I do agree with Barbara Davies that the chapters and parts aren’t particularly valid divisions in this novel. Some of the chapter breaks leave less elapsed time than tends to occur in section breaks within chapters. However, I disagree with Davies that the plot would have had more impact if the book had been shorter. The story builds its power from the missteps. First there are Christie’s (failures of) understanding of her own relationship with the world. Whilst they fitted well with my own pleasure in revisiting the past adventures in Orthe, they are also important for convincing the reader that this place has a thickness, a reality worth saving for itself. This leads to Christie’s attempt to realign her loyalties, leaving her more torn than ever before as that is overtaken by events. By that stage, the book is certainly inexorable, despite the multiple, increasingly desperate, attempts to control both the colonisers and the colonised, to get them to step back from the brink. But I don’t think the disastrous ending is ever inevitable. Beyond Christie’s control, yes, but not predictable. And to come back to Davies’ point, the finish couldn’t be so convincing if we hadn’t run down so many other paths along the way. One element I found fascinating was the way the Hexenmeister intentionally undermined Christie’s inherited memories of the “natives” – preferring to destroy Christie’s belief in her self and her knowledge of the past, if that was a way to keep Orthe safe. The off-stage death of Max and the idea that hypno tapes have scrambled Christie’s brains almost succeed in making these convincing, but Christie didn’t feel like an unreliable narrator before. To my mind, Christie has become sufficiently Orthean that the psychosis she seems to have suffered away from Orthe are more like the off world sickness the Ortheans suffer – though I’d be hard pressed to find evidence for that. I can see why Maureen found these passages undermined the action, but the collapse of the world Christie cares about becomes so much more meaningful once she relearns quite how important it is to her. I’m interested that you thought the “external” attitude towards the colonised dated the novel, as McAuley’s review suggests that the Company shuttles destruction of harbours is “a specific parallel to the [then] recent US bombing of Libya”, something lost in the background from this distance of time. Do you think the (post) colonial messages of the book still have currency now? How important are they to the book? The white square of sunlight had moved on the dusty floor, falling now to illumine the corner of a low stone table. Molly leaned back against the wall. She watched the narrow slot of sky. Then she turned her dark, dazzled face towards me. I’ve lost the ability to balance fear against result, and gamble. This angular young woman has it still. Her tone carried the conviction that her present time and “the real world” are identical. Anyway, “The same theme, but darker” is pretty much exactly how Ancient Light stands in relation to Golden Witchbreed, in my view, which is to say that I think the (post) colonial commentary is absolutely central to Ancient Light, and an important but more backgrounded part of Golden Witchbreed. The resonances are built into every element of the novel: Christie’s heritage as a representative of Britain, and her move from government to commercial work between the two books; Molly Rachel’s heritage as a member of the “Pacifican” states, and her confidence in the validity of her actions; the Ortheans’ heritage as the product of a much earlier colonisation; the differentials in power and wisdom between the Ortheans and the humans; etc etc. The way the various motivations work themselves out strikes me as very much still having currency — aren’t PanOceania’s tactics of finding a justification for military intervention, combined with “trade and aid” packages, precisely a form of disaster capitalism? But it gets badly out of hand here, and this is where it becomes impossible to avoid talking about the ending. Gentle stacks the deck a little bit to get the outcome she wants — the inability of Ortheans to live offworld, for instance — but for the most part what’s impressive is how naturally the bleakness of the ending develops from the rest of the novel. There are few, arguably no, outright individual villains — you may want to challenge this? — but there is a destructive system in place that no individual can resist. As I said, I do think the weakness of this element of the book is its externalisation — per the conversation quoted above, it is through the lens of Christie that we see and judge everything. It feels more like a book written for people like Christie, intended to challenge simplistic assumptions they may hold about cultural contact, and less like the book that I expect would be written today, about how both sides are changed by contact. (Something like Ken MacLeod’s Learning the World, for instance, although that’s a much less detailed treatment than the Orthe books.) What’s your take on this? One thing that does complicate it, certainly, is the point you raise about Christie becoming more Orthean — which, via the Hexenmeister’s memories, she does in a quite literal sense. But to what extent is she a Jake Sully, coming in from outside to show the way? DL: On the question of villainy, I think Mary Gentle shows that each character is doing their best from their own perspective. Cory Mendez destroys lives and livelihoods, but with a desire to cauterize, to avoid the greater failures she has seen on other worlds. Molly Rachel – and most of the rest of the PanOceania people – are pursuing their careers, their promotions, their bonuses. Pramila Ishida takes up the fight for the oppressed, against the system, but by aiding the struggle of one local faction, she is instrumental in the disaster. I think she is a better comparison for Jake Sully who, to my recollection, swaps sides completely. However, Eywa comes to the defence of the planet in Avatar, whilst the Ancient Light has wholly the opposite capacity. And, as Cory’s complaints make clear, her security forces are being forced to operate with blunt tools due to the restriction on the level of technology she is allowed to bring to the surface as a peace-keeper. Clearly, if the war against the natives escalates, there is much more that can be done to protect the humans. There’s one character in Ancient Light, she is the military commander. She is the one that gives the reasons for taking the police actions that lead to the tragedy. I still cannot fault her reasoning I cannot fault her arguments. I wanted to all the way through, because I knew that what she was doing was disastrous. But I can’t argue with her reasons for doing it. I think that’s the nub of it — it’s easy to spot the wrong choices, harder to say what the right choices would have been. As for gender balance, my sense is that it’s less central to what Ancient Light is trying to do than to what Golden Witchbreed was trying to do. But it is striking, when you stop to thinking about it, that basically all the figures driving the plot — Christie, Molly Rachel, Cory Mendez, the Hexenmeister, Calil bel-Rioch — are female. Actually, what I did notice was that they were all adult characters; that is, they make a lot of characters in more recent sf novels look juvenile. It would be sad to think that’s a way in which the novel is showing its age. In her voice I heard the beat of that litany of death. And, as McAuley says, “Gentle pitilessly deconstructs her fantasy, her writing gaining in strength and vividness even as she abandons plotlines in midair”. I was devastated when I first read that ending – it was utterly unexpected and really kicked me. I felt that Gentle had destroyed a world I loved and was angry that she did so. She said (a decade ago) “I still occasionally get hate mail from people about the end of Ancient Light.“ Even in May, when I commented on your review of Golden Witchbreed, I was not sure I could go back into a world which I would only lose again at the end – but I’m very pleased I have. Gentle writes so well and tells exactly the story she wants to, when it would be so much easier on the reader to flinch, to back down, to allow the possibility of a sequel. And there is the rest of her oeuvre to devour – I’ve just realised I have a whole Mary Gentle novel I’ve never read! NH: Because I did have an intimation of what was coming, I didn’t feel kicked in the way you did, first time around — although it is devastating, as you say, it also has a feel of rightness. On the last page, facing the realisation of what’s happening, Christie tells us that the characters “stand as if this is a ritual that we must conclude”; to go back to Clute, it just goes to show how thorough Gentle is about her alloted task of demolition. I might wish more writers in sf/f showed a willingness to end their stories so firmly! Not necessarily unhappily, you understand, but in a way that doesn’t require or encourage continuation. Any chance of using the under the cut “more” feature? Otherwise, it’s going to be hard to people to browse your week of women writers. It goes against everything I stand for! But I’ll think about it. I am planning to provide an index post at the end of the week. One thing I remember about both books is that Lynne’s First Contact experience is actually an ongoing sequence of First Contacts. In colonial or post- colonial SF that seemed to me quite unusual. In that interview you quote Mary says something about having the idea for the end of Ancient Light first and writing towards that. (Can’t find my own copy to be precise.) That explains some of the awkward plotting and deck-stacking perhaps. Quite. Real people, real problems, no easy fixes. I’ve never really understood the objections to Ancient Light – it’s always struck me as proper grown-up sf. One of Gentle’s strengths is that she makes her universe so credible and complex. As well as the whole human/post-tech Orthean contrast, there’s also the difference between the Hundred Thousand and the southern continent. I don’t find that at all dated. When I reread the Orthe books a few years back the news was full of African boat people trying – and too often failing – to reach the Canary Islands. I rate Orthe and Ash very highly indeed. The rest of Gentle’s work has never engaged me in the same way, but if I’d created Christie and Ash and their worlds I’d die happy! !